Since the days of Aristotle, dolphins have impressed humans with their incredible swimming speeds and aquatic acrobatics. There are at least 32 known species of dolphins, many of which remain largely unstudied. A few species, though, have stood out from the crowd and haven't been shy about showing off their skills for humans. This little guy is considered the "speed demon" of dolphins. Weighing 480 pounds or less, he is one of the smaller dolphins, but his burst swimming speeds have been reported to be as fast as 34.5 miles per hour. When comparing dolphin swimming speeds, he has earned the title of fastest swimming dolphin. The Dall's porpoise can be found across the North Pacific, from Japan to the Bering Sea, and as far south as the United States-Mexico border. He eats mostly smaller fish, such as anchovies, herring and smelt, but will also dine on octopus and squid, and occasionally on crabs and shrimp. The body of the Dall's porpoise is dark grey or black with white panels, and can be distinguished from all other dolphins by the white "frosting" on his tail flukes and dorsal fin. The orca, or killer whale, is the largest of all dolphin species and shares the distinction of fastest dolphin. He may dwarf the Dall's porpoise in size, but he keeps pace with his tiny counterpart, swimming at burst speeds of 34.5 miles per hour. The killer whale's swimming speeds are especially impressive, considering a bull male can grow up to 32 feet long and can weigh in at a staggering 12,000 pounds. There are two distinct types of orcas, living mostly in coastal waters between the polar regions and the equator. Pods of resident orcas, who tend to remain in one area or region, prefer feeding on fish such as mackerel, herring and salmon. Transient orcas, who roam from place to place, more commonly feed on other marine mammals such as seals, sea lions and even other whales. In comparison to the Dall's porpoise and the orca, the bottlenose dolphin seems almost slow in comparison with a maximum swimming speed of 17 miles per hour. He deserves to be mentioned, though, because he is the most popular and easily recognizable of all dolphin species. Bottlenose dolphins are very social. They can be found swimming in all of the world's warm, tropical waters, and have been known to approach and interact with humans. The bottlenose dolphin's friendly persona is further enhanced by a curved mouth that makes him appear to always be smiling. Water is about 750 times more dense than air, which means a dolphin must be able to generate a tremendous amount of power in order to swim fast. 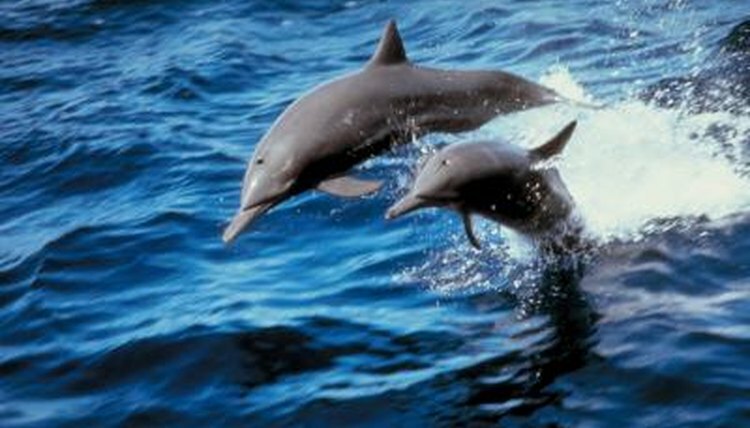 The dolphin's tapered body helps him glide smoothly through the water, cutting through much of the water's resistance. When moved in an up-and-down motion, the dolphin's muscular tail and wide flukes generate the power needed to propel the dolphin forward. What Temperature of Water Do Dolphins Live In?